If you’re an apprentice or junior chef and are looking to take your career places, put yourself to the test and enter the Nestlé GOLDEN CHEF’S HAT AWARD. Celebrating 50 years in 2015, Australia’s longest running culinary competition for young chefs is a great learning experience that offers you the chance to really find out where you are as a chef. Along the way you’ll be mentored by culinary instructors and given access to a national network of professional chefs. 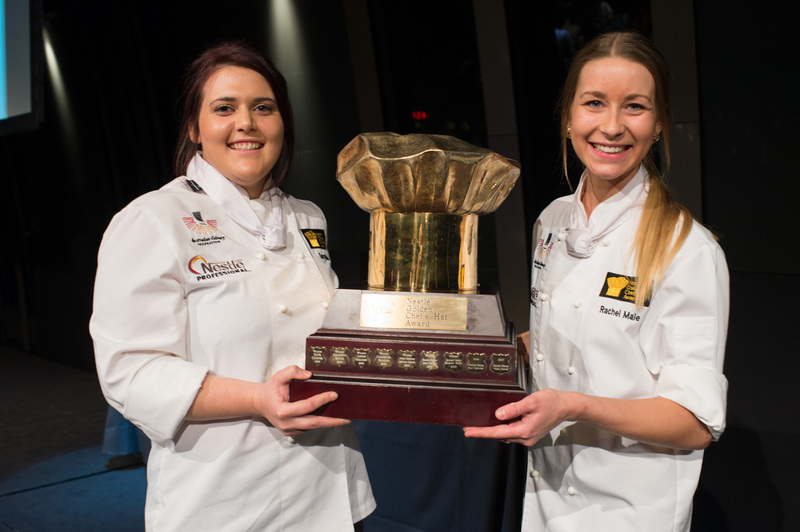 If successful in your region’s heat you will get to cook-off against the country’s best young chef talent at the National Final in Sydney this September, with the chance to win medals to nationally recognised standards in entrée, main and dessert course categories. This year’s national winning team will be awarded what promises to be a career kick-starting trip to South Africa, for a once in a lifetime food safari experience. The competition is open to apprentice and junior chefs, who are residents of Australia and under 25 years of age on 30th September 2015. Entries are open until Friday 8th May 2015. 2014 National Winners Tara Bain and Rachel Male.